Bring your umbrella. Yes, Bergen has beautiful sunny days but the city also has a fair amount of rain - or maybe mist is a better word. Be prepared for a sudden shower with an umbrella. Best time to visit Bergen: mid-May for snow-covered mountains; late June for long days (sun hardly sets); and September for fall foliage. Is it a coincidence that Bergen is surrounded by mountains? It might be, but the second-largest city in Norway nonetheless seems to have an appropriate name. The Norwegian word “berg” translates to mountain. 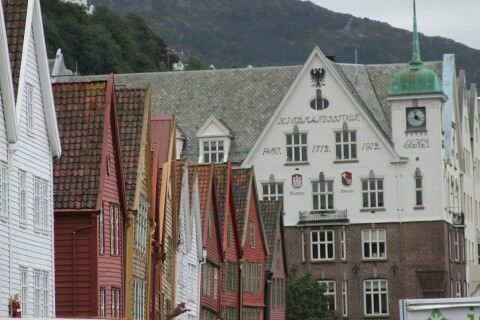 The silhouettes of these peaks will be accompanying you almost wherever you go in Bergen. A place of enchantment, Bergen’s epithets include “Trebyen” (Wooden City; it has many wooden houses), “Regnbyen” (Rainy City, due to its 200 days of rain a year), and “Fjordbyen” (Gateway to the fjords). As for the rainy weather, most visitors quickly learn the necessity of rain jackets and umbrellas. Bergen is even the site of the world’s first umbrella vending machine. Bergen on a misty day. Think Seattle but with a longer history and a UNESCO World Heritage attraction. Photo taken from the cable car Ulriken, 643 meters above Bergen. Beautiful views over Bergen. 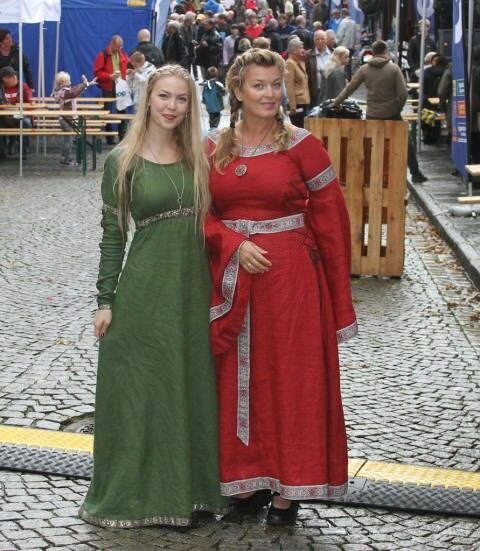 The city was founded in 1070 by Olav Kyrre as a commercial center. 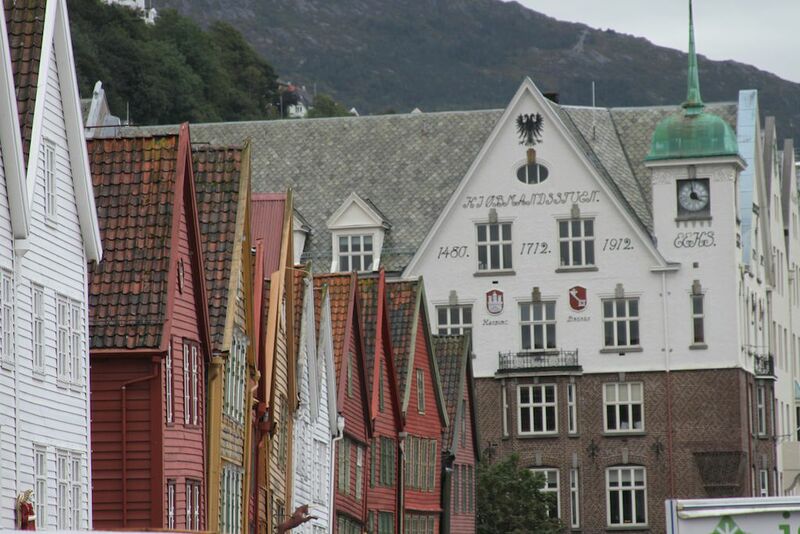 The surviving Hanseatic wooden buildings on Bryggen (the quay) are topped with triangular cookie-cutter roofs and painted in red, blue, yellow, and green. Monuments in themselves (they are on the UNESCO World Heritage List), the buildings tempt travelers and locals to the shops, restaurants, and museums inside. Evenings, when the Bryggen is illuminated, these modest buildings, together with the stocky Rosenkrantz Tower, the Fløyen, and the yachts lining the pier, are reflected in the waters of the harbor—and provide one of the loveliest cityscapes in northern Europe. Raise your head a bit further, and you will be able to rest your eyes on the mountains surrounding the city. For a change of perspective, travel to the top of one of the mountains and enjoy a splendid view of the city. The Fløyen funicular railway starts at the Fisketorget (the Fish Market) in central Bergen and brings its passengers 1,050 feet/320 meters up a mountainside. If you feel up to it, it’s possible to return to the city on foot. 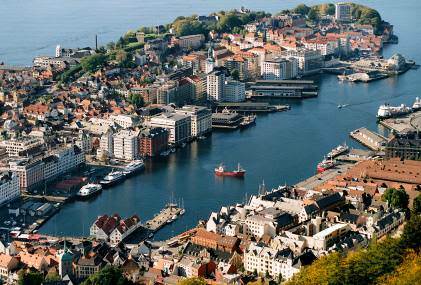 During the Middle Ages, Bergen was the largest city in the Nordic countries. Oslo, Norway’s capital, did not outgrow Bergen until the 1830s. Some Norwegians say this is one of the reasons why people from here are – still – so proud of their city. Even though Oslo nowadays is more populous, Bergen retains its position as an important shipping center. Traders from the city have been doing business in continental Europe for a long time – and vice versa. Contacts with the Hanseatic League, an economic alliance of trading cities in the 13th to 17th centuries, resulted in Bergen’s possibility to export fish and import necessities such as grain. With some 230,000 cruise ship passengers visiting Bergen each year, the city is one of the most popular cruise destinations in Norway. The city is within walking distance from the port. Hands-on at the Bergen Aquarium. The Fish Market is the famous square in Bergen. Even if you don’t plan on bringing anything back to the ship for dinner, the atmosphere at the Fish Market makes it worth a visit. Shopping. Bergen is a city, with an offering becoming a city: from large department stores to smaller, specialised boutiques. 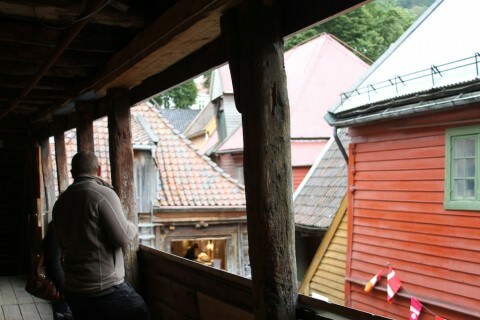 The old wooden building of Bergen's UNESCO World Heritage waterfront, Bryggen. Featuring more than 40 wooden houses characteristic for Bergen, the open-air Gamle Bergen museum (Old Bergen museum) shows how life was lived in Bergen in the 18th, 19th and 20th centuries. Gamle Bergen sorts under the Bergen City Museum, which also includes several other museums. Examples include The Fire Museum, the well-known Rosenkrantz Tower, and the Leprosy Museum. Bergen by boat and coach. Some tours will combine a boat ride with a coach tour of the city. Participants will experience not only Bergen itself, but also the archipelago that gives the city shelter from the North Atlantic. 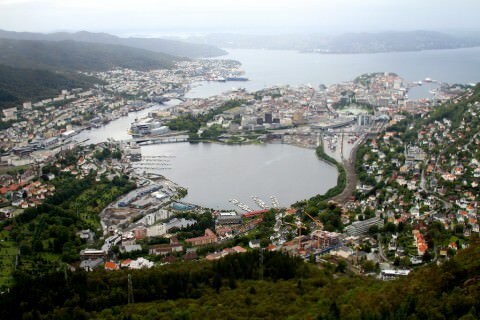 Coach-only tours will focus on the city and its main attractions, sometimes including a ride with a funicular for a view of Bergen from above (see above under Do Not Miss). Boat-only tours sometimes make landfall on one of the small islands that together constitute Bergen’s archipelago. The Hardangerfjord. Situated south of Bergen, the Hardangerfjord is sometimes referred to as “the Queen of the Fjords”. 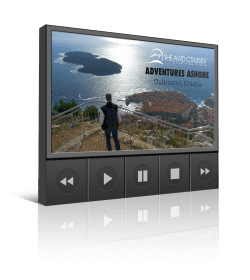 Some cruise lines offer coach tours to the area, allowing you to take in the beautiful scenery. It is likely that you will make at least one ferry crossing: you will be travelling in an area where a part of the road can have a departure time. Do as the Norwegians: take a hike. Hiking on Fløien, one of the seven mountains surrounding Bergen, is an experience that offers spectacular views of the city. 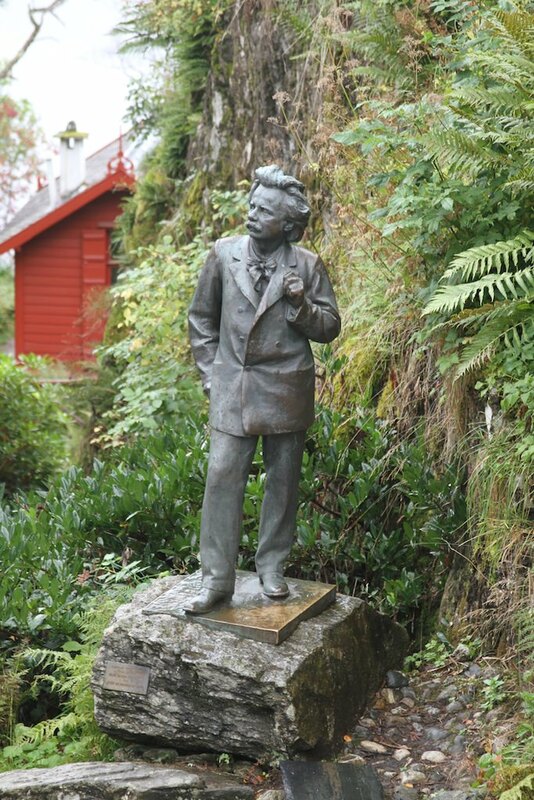 The Norwegian 19th century composer Edvard Grieg made his home at Troldhaugen, which is now one of Bergen’s most well-known attractions. A coach tour is a good way to get to Grieg’s house, which is situated at the Nordåsvatnet (the Nordås Lake). Drive eastwards for a while, turn right, and you can be in Oslo after 308 miles/497 kilometers. It’s a longer drive to Trondheim: 412 miles/663 kilometers. 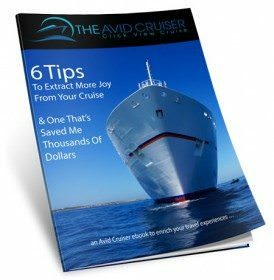 Avid Cruiser Posts, Photographs and Videos Featuring Bergen.